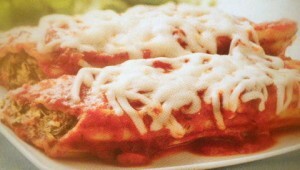 This delicious easy-to-make manicotti recipe from Betty Crocker is a great make-ahead dinner idea. Keep one handy in your freezer for one of those hectic days when you are short on time and energy! 1. Heat oven to 350 degrees F. In an ungreased 13×9-inch baking dish, spread about 1/3 of the pasta sauce. 2. Stir together the spinach, cottage cheese, Parmesan cheese oregano and pepper. Fill the uncooked manicotti shells with the spinach mixture; place on sauce in baking dish. 3. In a medium bowl, stir together the remaining pasta sauce and water; pour evenly over the shells, covering completely. Cover and bake for 1 hour. 4. Sprinkle with the mozzarella cheese; cover and bake 15 to 20 minutes longer or until the shells are tender. Note: You can assemble this recipe, cover and refrigerate for 24 hours before cooking; then bake as directed. Or cover tightly, label and freeze for up to 1 month; bake for about 2 hours. Hi Emily, My friend makes Manicotti and I always thought it was so hard to make. I can follow this recipe and I like the 24 hour refrigerator thing. Thanks for sharing this today. Also thank you for your visit and comment. I am happy to hear from you. This looks great for a cold day like today!